Social media has become an invaluable asset for marketing in higher education. According to research on social media use in the U.S, social media platforms are the most popular among the 18-29 demographic who spend a considerable amount of their time on different social networking sites. Consequently, universities are ramping up efforts to connect more with their target demographic and engage on social media channels. As social media has now become the first point of contact between a prospective student and a university, it is crucial for institutions to find an authentic voice for their brand and to build a two-way conversation channel with their audience. In this article, we look at how some of the top-ranked universities from the U.S use platforms like Facebook, Instagram and Twitter to appeal to their young audience. The universities analyzed are: Arizona State University, Harvard University, New York University, Northwestern University, Stanford University, The University of Arizona, The University of Texas at Austin, University of Houston, University of Michigan and University of Washington. Facebook continues to be the biggest platform for brands. All the universities analyzed have an active presence on the platform. Harvard University and Stanford University have the largest audience size with 5.2M and 1.3M fans respectively. For the time period studied, Northwestern University and New York University saw the highest growth with NYU adding an impressive 67.2K new fans. Harvard University, University of Michigan and Northwestern University boasted the top posts in terms of the number of likes and shares. Twitter has been a favored medium for universities to reach out to their prospective students. From adopting a peppy and upbeat tone to sharing research articles, universities are vying to find their voice on Twitter. All the 10 universities have a presence on Twitter. Harvard has the highest audience size of 860K followers and Stanford comes next with 613K followers. 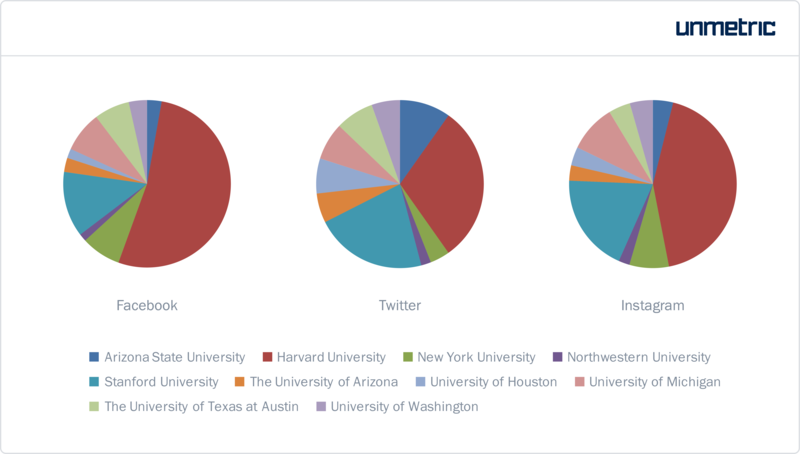 Harvard University and the University of Houston performed the best on Twitter with good engagement in terms of likes, replies, and retweets. Instagram has transformed from being an emerging platform for universities to an established forum with all the 10 universities analyzed using the platform. Harvard and Stanford lead the pack with an audience size of over 794K and 351K followers respectively. They also saw the highest average engagement considering their huge audience size in comparison to the rest. On average, the universities posted over 871 times on Facebook during the time period. As brands struggle with the decline of organic reach on Facebook, universities are increasingly posting more content to gain engagement and reach a wider audience. From posting over 524 and 565 times on average in 2015 and 2016 respectively, there is a considerable increase in the volume of posts being published. Arizona State University had the highest volume of published content (1,456 posts) while the University of Arizona had the least (209). 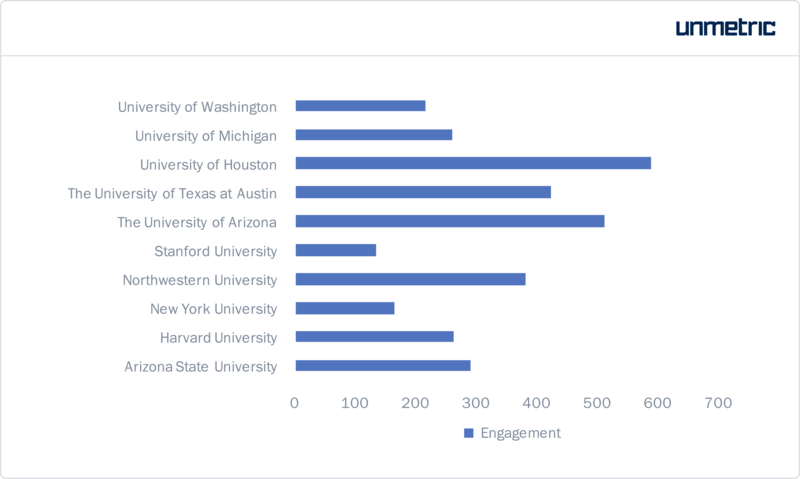 Despite their low posting frequency, University of Arizona saw the highest average engagement on posts after University of Houston. On Twitter, the group of universities tweeted 4,050 times on average, with over 55% of the tweets being proactive and 10.3% of them being replies. On average, this set of universities published 73 proactive tweets per day and replied to 7 user tweets. Arizona State University tweeted the most while University of Houston had the highest number of retweets and likes. Instagram saw less frequency in posting with 368 posts on average. University of Houston had the highest volume with 892 posts, followed by University of Michigan with 575 posts. Despite a higher number of posts, Houston showcased the least average engagement while Harvard had the highest engagement. All 10 of the universities analyzed promoted their content on Facebook. 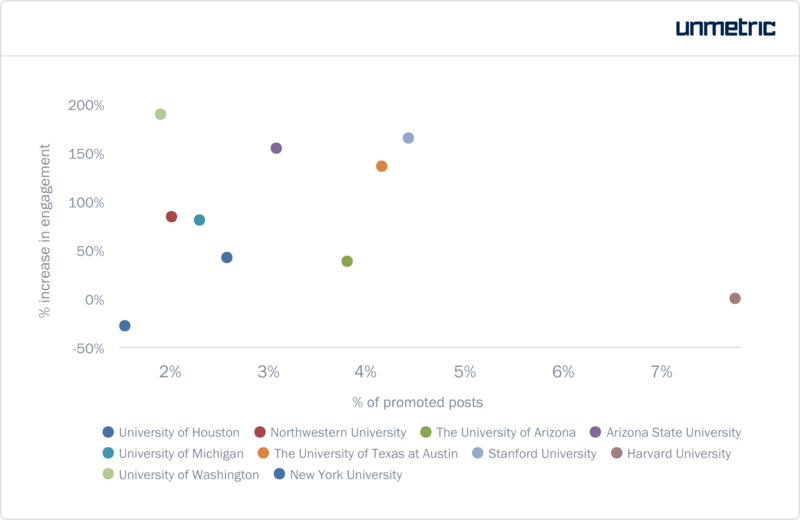 Harvard University had the most number of promoted posts, while Arizona State University had the most organic posts. University of Washington saw the biggest surge in engagement after promoting their Facebook content. On average, universities promoted just 3.2% of their Facebook content. If your target audience are the ones that are glued to their 5-inch screens, finger-tips tapping away, then you need to be on your toes and prompt in your customer service. From relaying important information and announcements to the student community, faculty, alumni etc. to engaging with their prospective students, Twitter is ground zero when it comes to customer service for universities on social media. 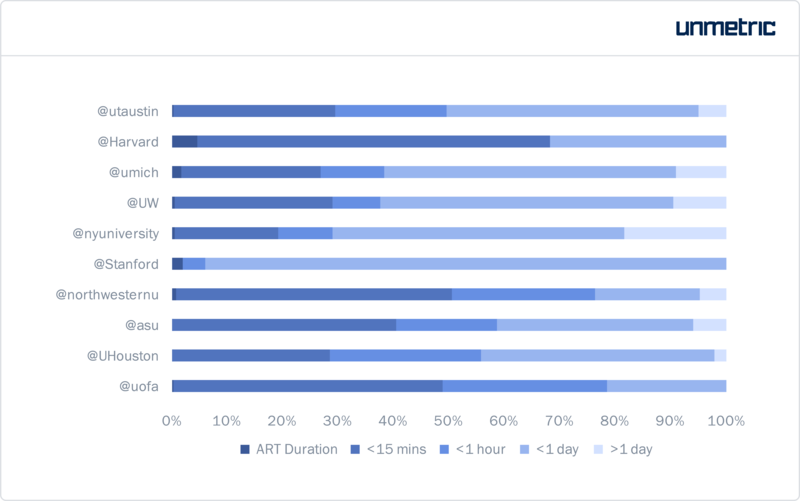 In terms of responsiveness, University of Houston had the best response rate while University of Arizona had the best average reply time and replied the fastest with close to 50% replies in less than 15 minutes. New York University, on the other hand took the longest to reply with close to 70% tweets being responded to after more than 24 hours. Of the replies universities tweeted out, plain text and request to view a link are the oft used replies. Universities are lucky to be equipped with a built-in community and social media is a great platform to engage with this community. Universities regularly post about events, concerts, sports and even just aesthetic images of the campus and other infrastructure to show how great life is for their students! Social media platforms act like a virtual cheerleader for their community. Appreciation posts and shout-outs for achievements of their students, faculty and alumni are hits among their audience. Not only do these posts aid in promoting the university’s brand and campus culture, it also helps in nurturing a feeling of community and pride in their audience. Research is the backbone of an academic institution and universities are extensively talking about their latest research studies and discoveries on social media. Not just innovative research from various fields, even works of art and matters of socio-political debate find a space on their social media. Universities are using social channels to advertise themselves as authoritative figures in the field of research and academia and are also making their opinions clearly heard. Universities realize that, ultimately, their community is built by students and they are what makes their university unique. All the universities analyzed have shunned their serious, scholastic tone of the past to sound more approachable, fun and friendly. There is no dearth of hashtag campaigns when it comes to universities. From non-branded hashtags like #mondaymotivation and #throwbackthursday to curated, branded ones like #NYUsummer and #harvardwinter, these higher-ed institutions are completely on-board with the hashtag tradition. Funny anecdotes, GIFs, pop-culture trivia, quirky campus traditions, behind-the-scene pictures and personal stories of students etc. make up for great, shareable content for these universities. This human-centric approach is playing a crucial role in communicating their brand to their prospective students. There’s no more running away from social media. Embrace all the major social platforms and use different channels as multi-tools for engaging with different type of content and for different purposes. Nurture your social media as a platform for your community to share their stories with each other and have a conversation with you. Use social media as a conversation channel and not just as a broadcast tool. Like brands, educational institutions need to be consistent with content. Even though there is no effective correlation between frequency of posts and engagement, consistency is important to have engagement and retention. Don’t restrict yourself to just scholastic content. Relatability is key for engagement and its important that your content resonates with your audience. Explore different styles and don’t be afraid to experiment with what’s trending and in vogue. Keep track of trends and changes in social media platforms so that you can reach out to students in relevant and engaging ways. Adapt promptly and deliver content in ways your audience likes to consume it. What are you waiting for? Sign up to see how Unmetric can help your university crush it on social media. ← Facebook Dark Posts Come into the Light – Finally!